While the general benefits of paper washing are known what you are trying to achieve must be tailored to each object. 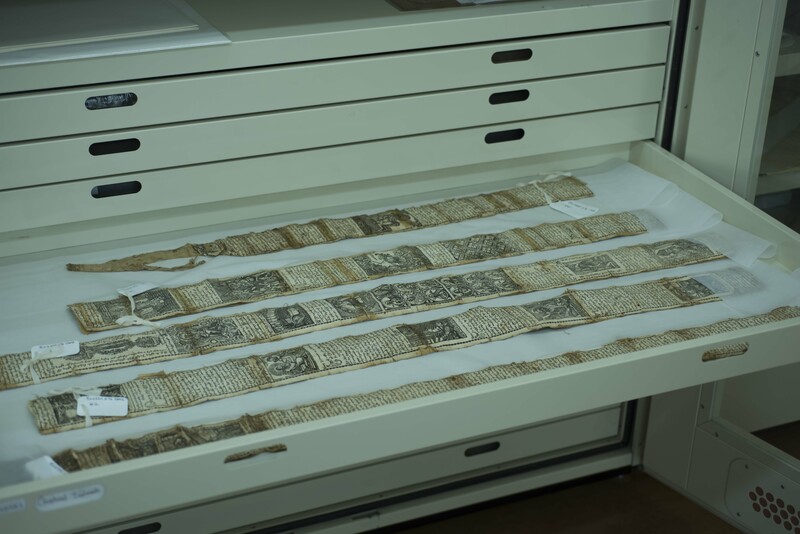 In the case of my 18th century Armenian Prayer Scroll my goal was to remove the linen lining and the animal glue adhesive from the paper which would allow the scroll to move better when rolling and unrolling. For this 18 foot long scroll the first thing to do was to dis assemble the scroll by cutting the lining along the existing complete tears in the scroll. This gave me 12 reasonably sized sections of the scroll to wash. I then humidified the scroll for 45 minutes before washing. This is an important step before any washing treatment as it relaxes the paper fibers and is a slow introduction of water to the object so that it is not ‘shocked’ when direct application of water is applied. Then I heated the deionized water to 28°C to give the water a bit of a fighting edge against the very strong animal glue. Once the section of the scroll had been humidified and the bath prepared I used bondina as a sling to lower the section of the scroll into the water. The scroll was immersed in the water for 20 minutes while a brush was used along the edge to agitate the water and keep a light flow of water running along the scroll. Then I removed the scroll from the water from and using a bamboo spatula lifted the linen backing off. The thickness of the animal glue adhesive that was revealed was shocking to everyone in the lab. The glue is almost an entire layer in itself and needed to be scraped away from the back of the scroll with dental tools. Once the glue had been scraped away the scroll section went back into the bath for a rinse of remaining glue. The washing was beneficial to the scroll and it is now in a dis assembled but clean state and will be rescrolled soon.